In an increasingly competitive social media ecosystem, Google has made a new addition to Google+ that could separate its social network from the rest. Google has integrated its online store and its social networking platform even more closely with a recently introduced feature. Google+ users can now post direct links to Android apps from the Google Play store on to a user’s timeline, making it easier to share games and applications. Once the link has been posted, the recipient will be redirected to the app’s Google Play page. An install prompt will also appear to demonstrate how to download the app with a single click. 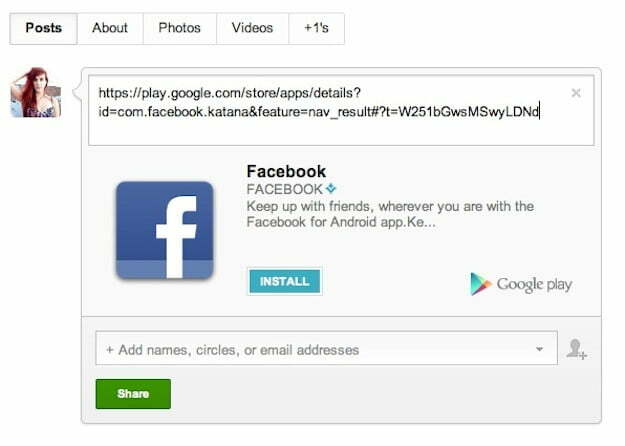 Google+ automatically embeds an image and description of the app alongside the link. Similarly, When Google Play patrons +1 an app within the store, the app is automatically shared on Google+ but without the Install/Buy buttons. This isn’t the first time the search engine giant has attempted to connect its Google Play store with Google+. The company previously added a function that allowed users to share their favorite music tracks and albums on another user’s profile, complete with 30-second previews. However, there has yet to be a feature that lets users instantly share movies via Google+. As Google introduces new sharing features, it’s becoming clear that the company is attempting to facilitate the way users access media content through the Google Play store. Last week, Google announced that music and movies from its online store would be available on Google TV in Germany, France and the UK. While the addition of instant app sharing may be a subtle update for Google+ it will undoubtedly streamline the way Android users recommend and share apps. It could also shape the way businesses and brands promote their mobile presence, giving Google+ a unique edge against competitors Facebook and Twitter. Each social media platform has its own flavor when it comes to fulfilling business needs: Facebook gives brands the chance to showcase their product through a dedicated page and flashy cover photo, while Twitter lets businesses spark a conversation about their product among the Internet community. With Google+, users can now instantly download a company’s product. This could be particularly crucial for start-up businesses relying on social media to circulate their application.